Some random items...starting with disliking...Hostess' Donettes. Kinda disliking this Dunkin' Donuts' coffee...kinda too bitter, lots of acid too. 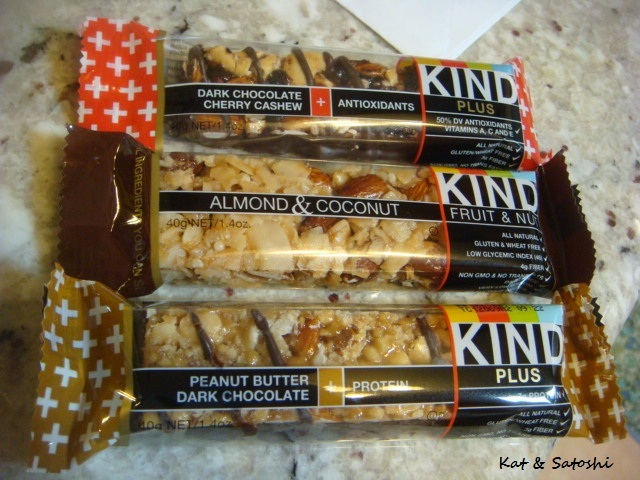 Really liking these KIND bars. 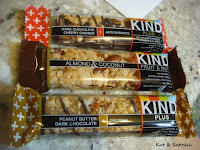 Especially delicious was the Almond Coconut bar, really chewy and just the right amount of sweetness. 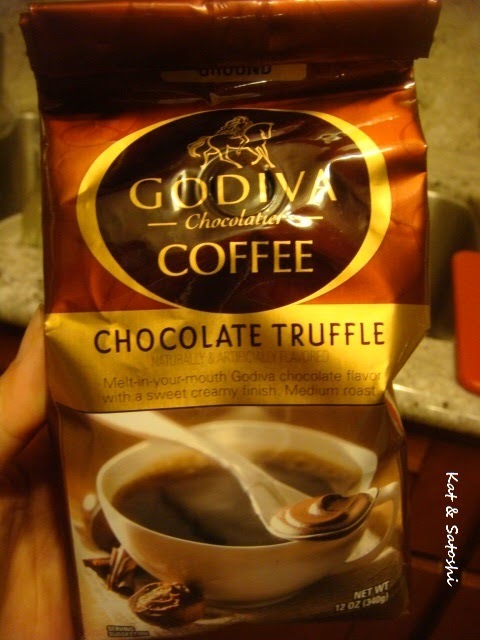 Godiva Chocolate Truffle coffee. 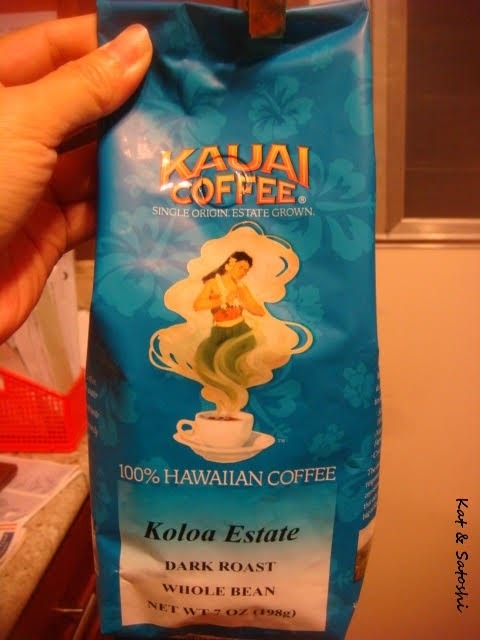 I am not too fond of flavored coffees because most times they are "fake" tasting. 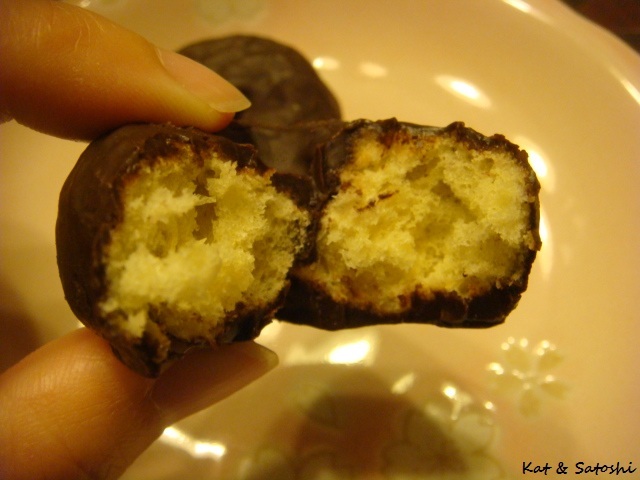 But this one is truly chocolatey, and if you add in milk, it is really creamy. 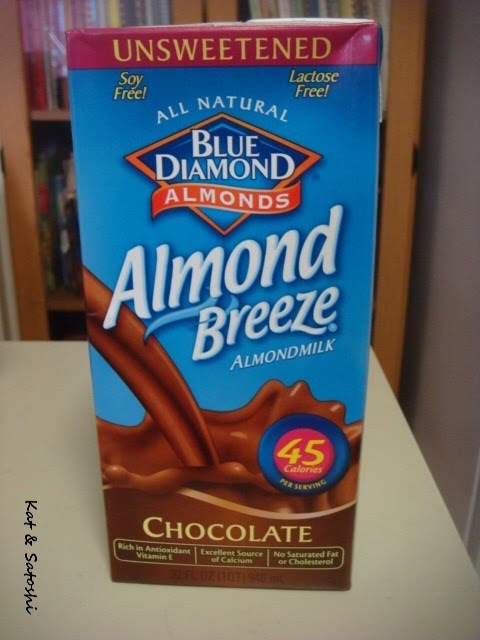 First time trying almond milk, but it was delicious. 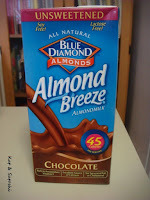 I bought the unsweetened version (chocolate too), perfect in my morning coffee. Tapatío hot sauce flavored Doritos. 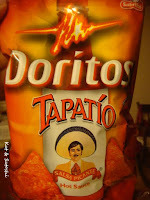 These chips will totally make your fingers orange, nose run and you may even cough a little, but in a good way. What have you been liking? disliking? 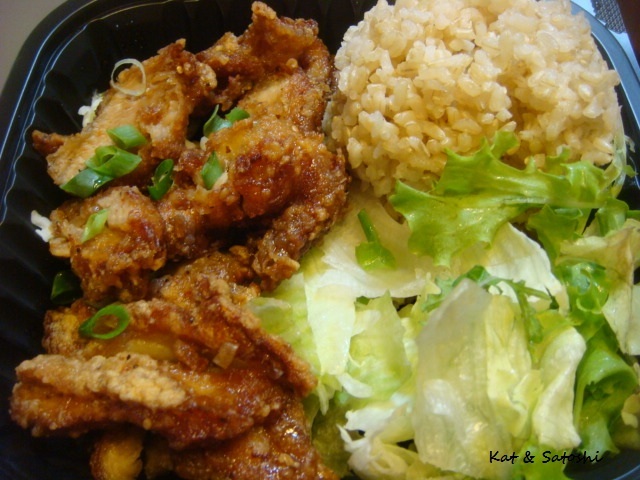 Mini Korean Fried Chicken plate from Zippy's. 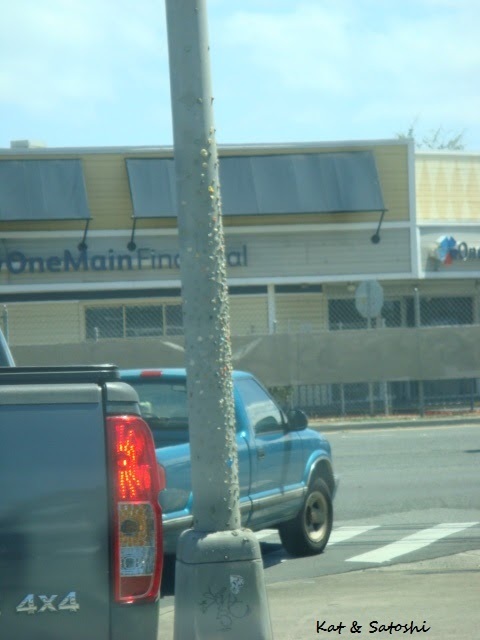 Their chicken is quite tender and moist. I liked the garlicky flavor of their sauce too. 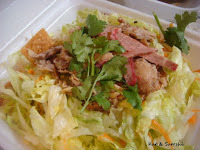 The salad dressing was delicious as well, Ginger Sesame...mmm! Mom ordered the Mahi plate, which she liked but, her peeve...please let her order mac salad and tossed salad in place of the rice, please?! 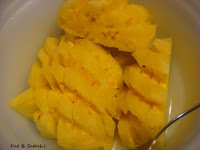 My first time peeling a pineapple. 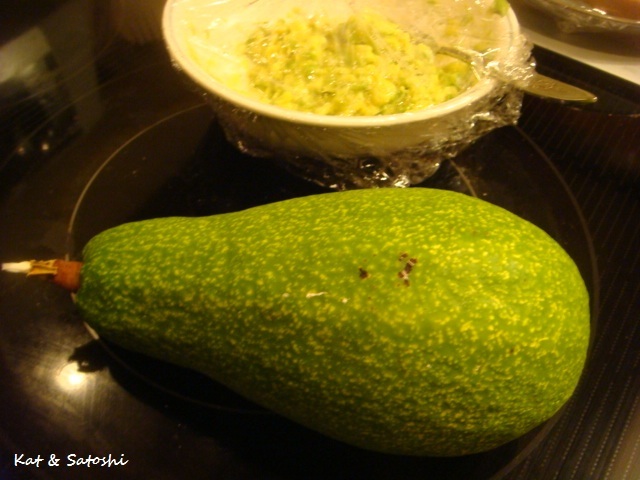 My blog friend, Genki has a great tutorial, if you've never peeled one before. This one was really sweet and juicy. Then on Monday, they looked like a stone walkway. I had seen this motto in Japan when they were having a British themed sale at an import shop. 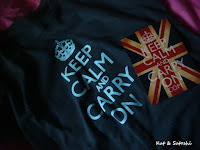 Apparently this motto was thought up during WWII as a way to "cheer" on the Brits. Before they could use it though, the war ended, so most of these posters were destroyed. Then 60 years later, a bookseller named Stuart Manley, found this among some old books. And even more recently, more posters were found and auctioned. 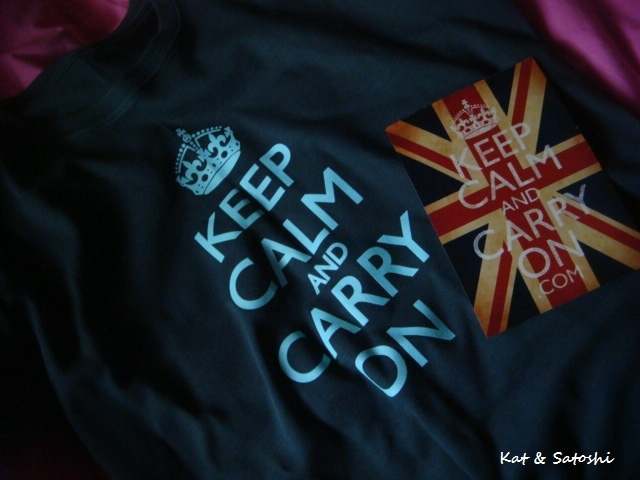 The company, Keep Calm and Carry On was able to purchase one and used it for posters, t-shirts and other knick-knacks. 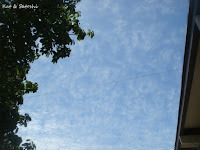 According to some, the motto sends a comforting and reassuring message. 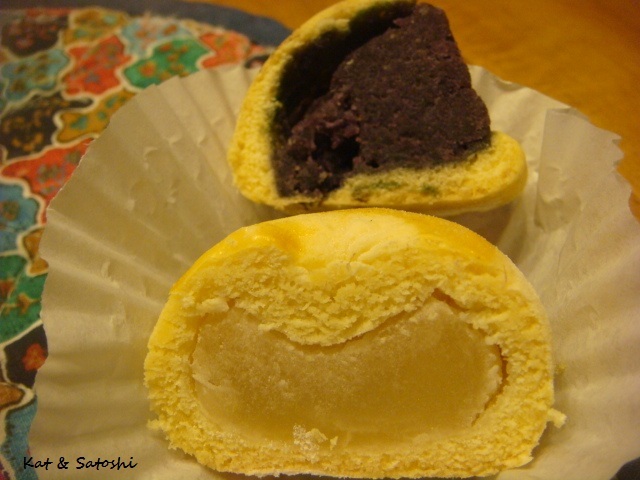 Two Ladies Kitchen is mostly renowned for their strawberry daifuku and assorted mochi. 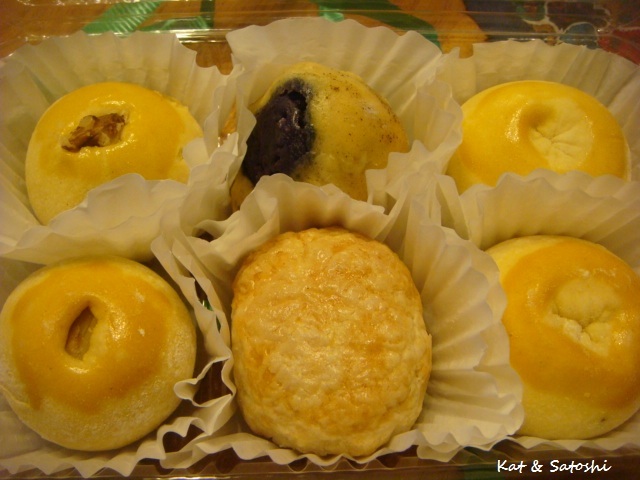 We recently received these assorted manju (baked/steamed sweet bean buns) from my Aunties who went to Hilo. Most of them were filled with shiroan (white bean paste) or tsubuan (chunky sweet (azuki) bean paste). They were good, but only one that was the most interesting to us was the top middle one that was filled with purple sweet potato. 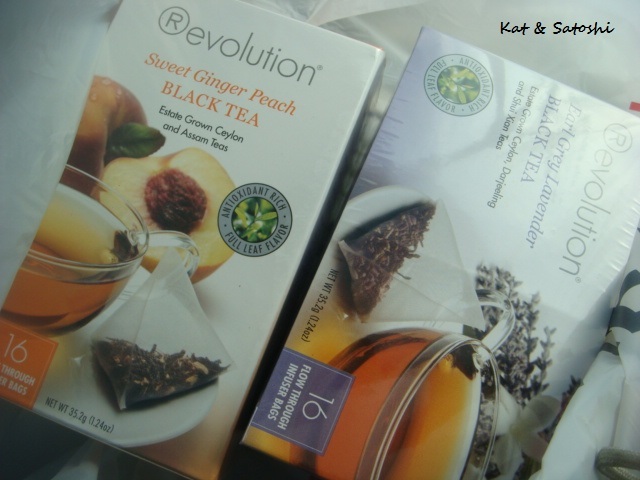 Reconnected with Revolution Teas recently...they were having a sale on these two teas at Safeway. Been enjoying the Sweet Ginger Peach as an iced tea and will save the Earl Grey Lavender for lattes this Fall. Have you reconnected with any foods/drinks lately? This varigated hibiscus plant in our garden collection blooms every year. 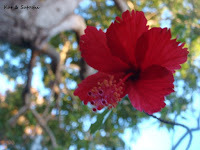 The leaves are green and white and the flower is kinda droopy. 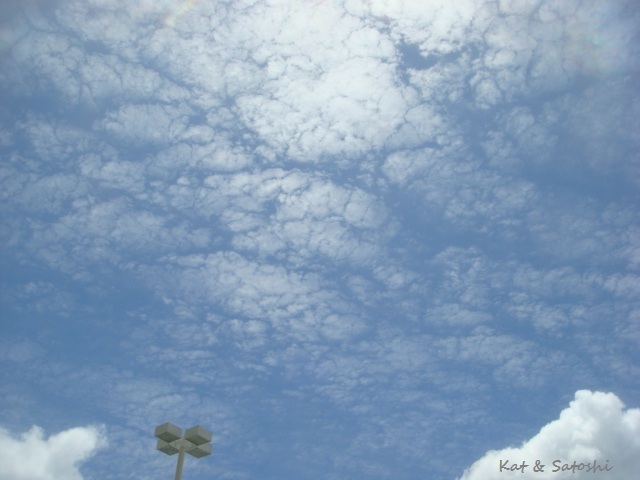 I took this from a low angle looking up. 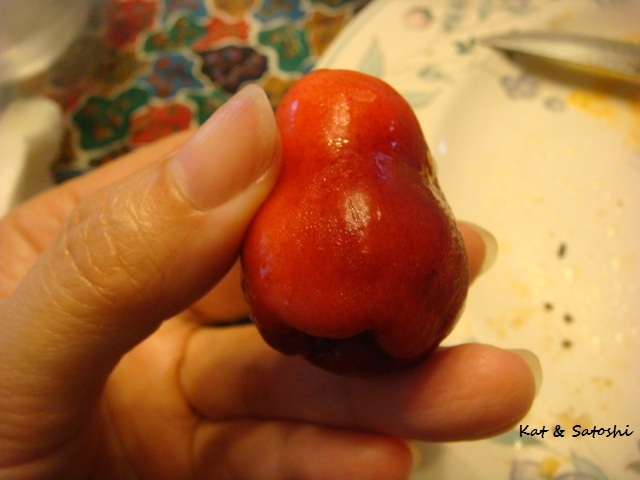 Last month, my aunty gave us these tiny mountain apple which she grew. If I remember correctly, it was her first harvest. They were delicious, a little tart, but very juicy. Lunch yesterday from Chun Wah Kam in Waimalu. 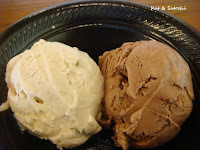 1 choice + 1 starch, $6.95...not bad. 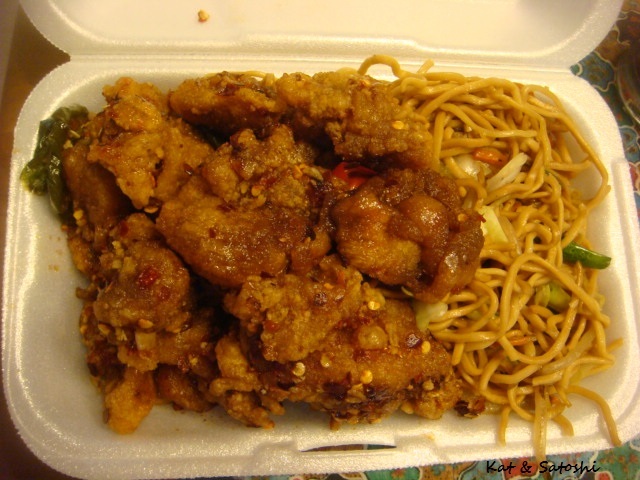 I chose the spicy chicken and their chow mein. Mouth.on.fire. but in an addicting kind of way. We recently received two avocados from my Mom's friend. 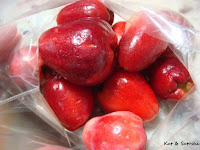 Mom waited patiently for them to ripen so that she could mash it up and eat it with sugar. 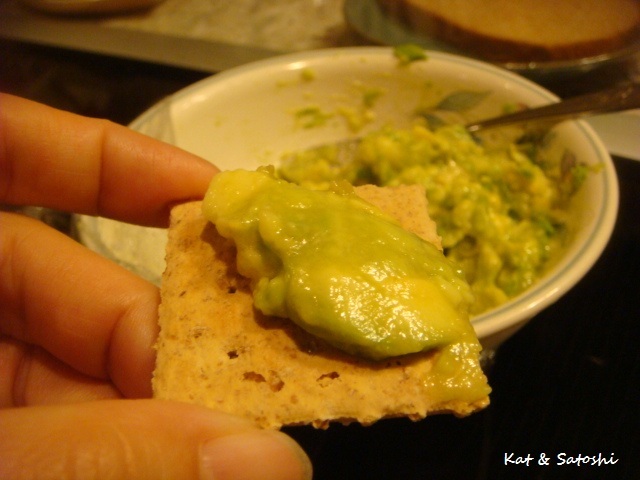 She said as a child she would eat avocado mashed and sprinkled with sugar for breakfast, or sometimes as a snack. Well, growing up, I was a picky eater. And though I knew she used to eat avocados this way, I had actually never tried it. The verdict? it was good, not mountain moving though and I think I would prefer my avocados in savory fashion. Finally! 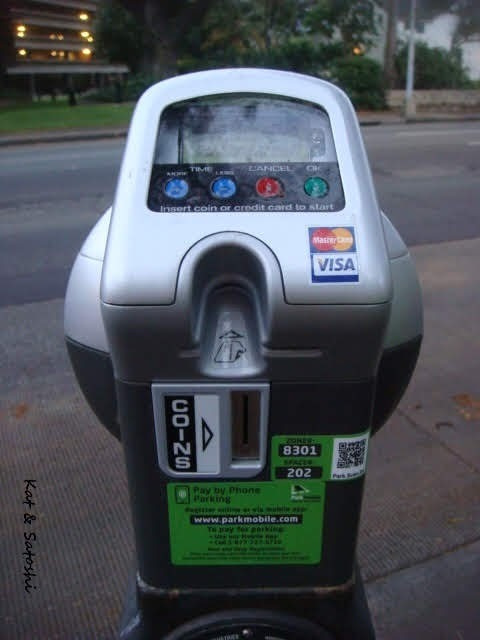 they have a way to deal with paying for parking without coins. 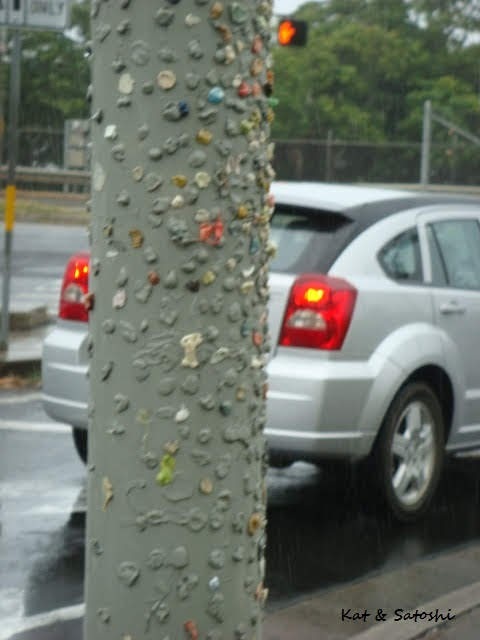 I remember having to use only quarters once in Waikiki. The best place for on street parking though is Hilo (in my opinion), 10 cents for like half an hour, I kid you not. Apparently this is temporary, they're testing it out. Oh and if you have a smartphone or cell, you can pay by phone too. I checked out the soap place that reader Sandy had mentioned, Kona Soaps (I hope this was the right place). The bars are $6.50 each but if you "go green" (no box) then they take off $.50 for each. Not bad, since they still send them to you in a paper package. I thought their wrapping with the raffia and wooden charm was neat too, can't wait to try these. Tried Yogi Tea (Ginger Tea) for the first time. 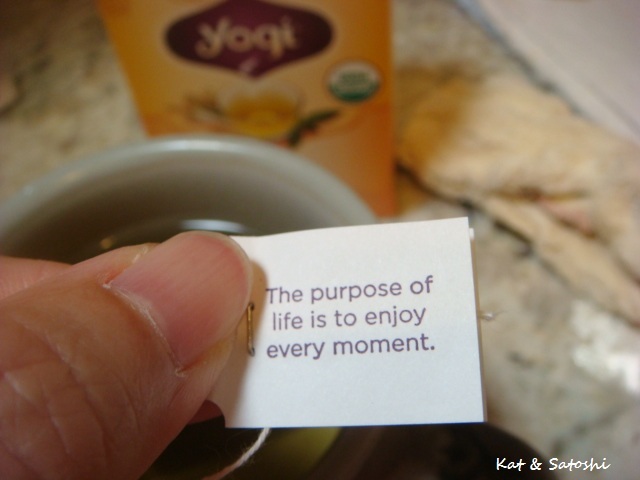 Love these inspiration tea tags...the ginger tea is also delicious too. I prefer dark roasted coffees, so I was interested in trying Kauai Coffee's Single Origin Koloa Estate. 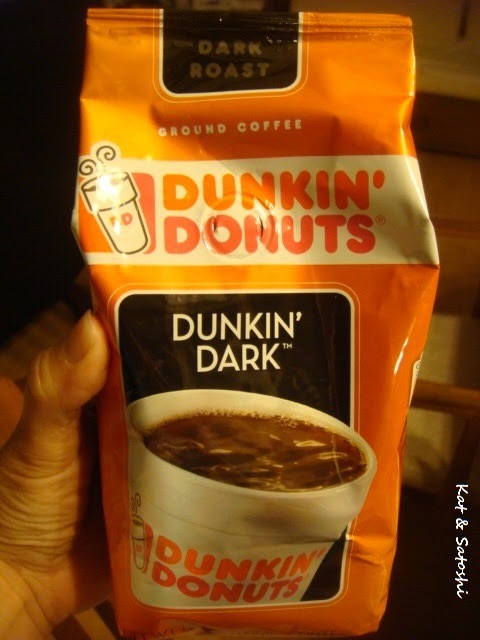 When you open the bag, you can smell the richness of the coffee. The acidity seemed to be high, but I enjoyed the full body. 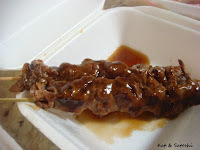 Mom's been wanting to eat these BBQ spareribs for some time now. They're from Ige's Kitchen. 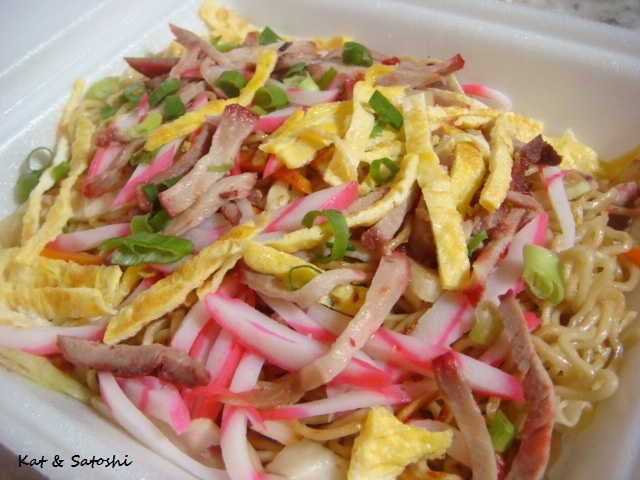 Ige's is a popular catering company in our area, I think the owners are Okinawan?! Growing up, I swear at almost any graduation or funeral, you'd find their food being served. Anyway, their food is good, well, except their mac salad, in my Mom's opinion. Mom was bummed because their mac salad only had macaroni and mayo. She was also jealous, because in my bite of mac salad, I had bits of celery. 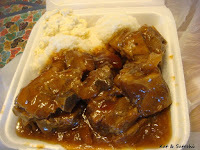 Their BBQ spareribs are super meaty and fall off the bone tender. And I love the cartilage part of the pork. And for $6.75 (tax included) this was a steal, not to mention we have enough for another meal. "Kenny's in the Kam Shopping Center in Kalihi", okay I've probably dated myself with that but anyway, it had been ages since we'd checked this place out. Since our 2nd try for Mitsu-Ken's was a bust, we popped into Kenny's to grab some things for lunch. 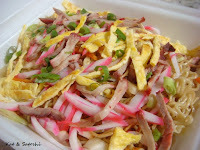 We ordered their yaki saimin (fried saimin), look at all the "goodies" on top too. Their beef sticks...boy were these tender and very meaty. And their chinese chicken salad, okay not much "goodies" on this one and their dressing could've been more "powerful" (more vinegary). Gotta say that while their food is delicious, they are pricey! For these 3 items we paid close to $25! Thought I posted about Bubbies before, but I guess not. Went there the other Saturday with BFF, Wen. It was pretty empty and the guy behind the counter wasn't too nice. We didn't know "how the system worked" so he turned into "Mr Personality" when we asked...oy! Anywho...their ice cream is sold by weight. The bigger scoops are apparently the size of a tennis ball and run about $3 each, maybe more depending on their weight! 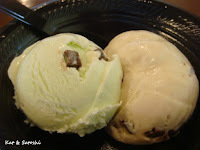 Since I didn't want scoops THAT big, I tried kiddie scoops of mint chip and peanut butter chip...$3.97 Both were great, though I liked mint chip better, the mint seemed naturally flavored. Wen tried their kiddie scoops of Banana Peanut Butter and Dark Dark Chocolate Chocolate Chip (I think that was the name). Real chunks of banana in this one and the dark chocolate one was rich! I think if they change the attitude of that server, we'll be back. 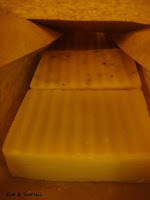 Ordered more Filthy Farmgirl soaps...love their fragrances! Most are made in Hawaii, though there are some made in Vermont. Also love that they give you 1 free whenever you order over $12...and shipping is FREE! 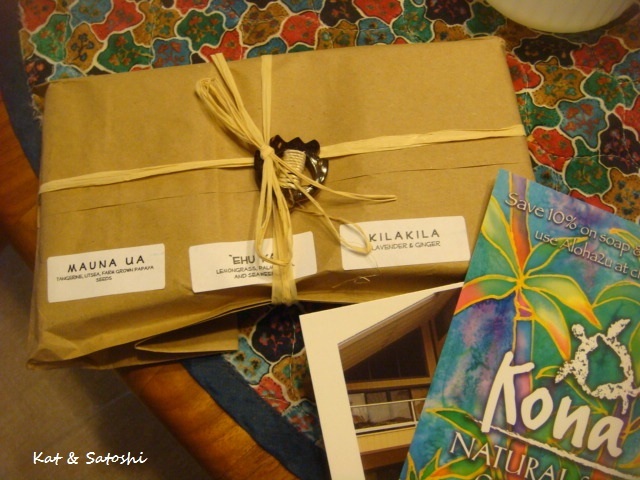 (to anywhere in the US) gotta love a company that gives free shipping to Hawaii! Starting with disliking...I had seen this on Candy Blog and wanted to try it. 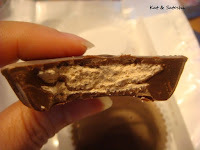 The chocolate was bloomed, on top of that the peanut butter was dried out, almost chalky..blah! I thought maybe it had to do with the expiry date...nope, that was fine. I guess it just didn't travel too well over the Pacific. Moving onto liking...If you look at my posts on beer, you'll see I prefer the dark beers. 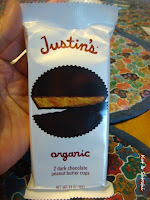 I recently spotted this dark chocolate bar and had to try it. 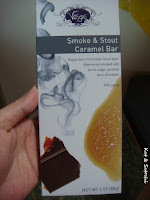 Vosges' Smoke & Salt Caramel Bar is delicious. 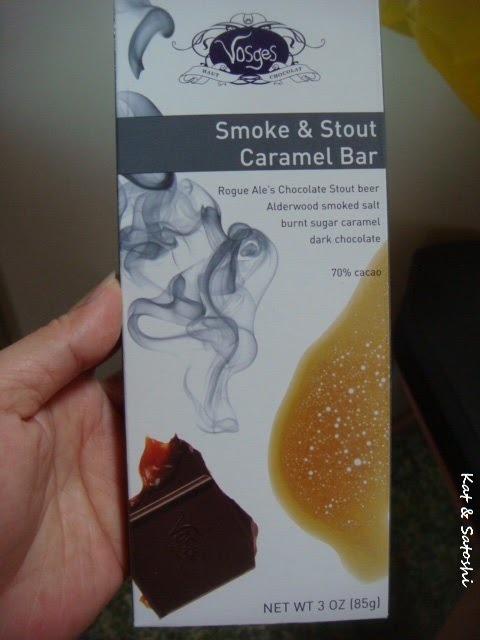 Using Rogue Ale's Chocolate Stout, Alderwood smoked salt, burnt caramel and 70% dark chocolate, the bar has a nice snap and the caramel that oozes out is dark too. I like the balance between sweet and salty. Also liking this sesame candy by Joyva. 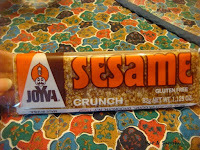 It is very hard so I would suggest breaking off little pieces and letting the hard candy melt before chewing on the sesame seeds. 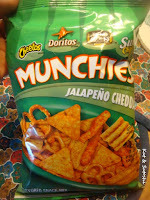 And lastly, these Munchies. Jalapeno Cheddar, get ready for orange fingers and the spiciness tickles the back of your throat. What have you been liking? Tried the mini Chili Moco from Zippy's. 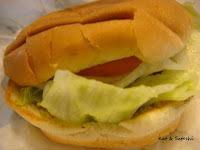 If you look online, you'll see that they used to use a mac salad sauce (which seemed similar to tartar sauce except no relish) between the rice and hamburger patty, I didn't see that sauce while I was eating it, so maybe they don't use that sauce these days. 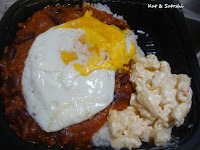 I liked this, the chili replaces the brown gravy that usually tops a Loco Moco. Satoshi, whose favorite is the original Loco Moco, would probably disagree though. 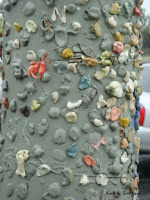 I remembered this gum wall that my blog friend, Jalna took a photo of. I had thought she had taken the photo somewhere in Australia, but it was in Seattle. On this trip home, I stumbled upon Hawaii's version. We happen to pass this pole quite frequently, so I've been wanting to take a picture of it. 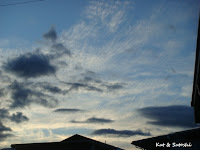 I finally got a chance to, but it was raining cats and dogs that day. 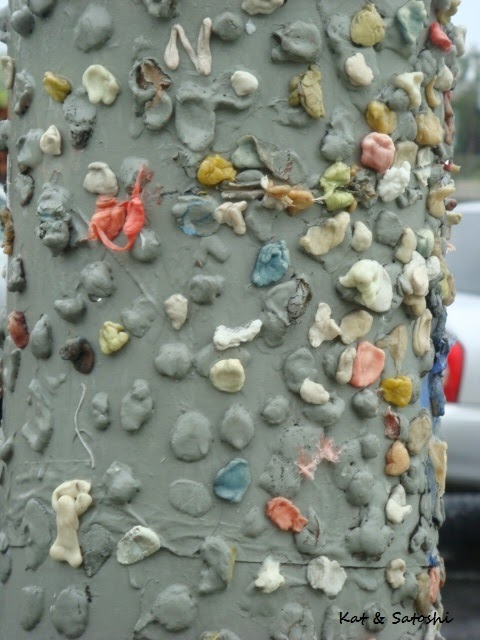 Still, it was pretty gross, don't you think?! We stopped in to Meg's Drive-In to pick up something for lunch the other day. I had never eaten here and neither had my mom, so we checked it out. I chose the BBQ burger deluxe...$2-something. The "deluxe" part is the addition of lettuce, onions and tomato. Um, the patty was so teeny, because I think they are homemade. I know if a guy got this burger, there would be complaints. 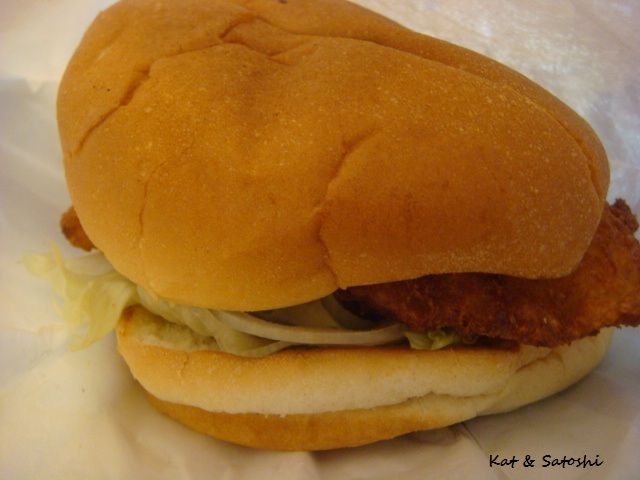 On the other hand, my mom chose their fish burger deluxe...$3-something. Again, the deluxe was the addition of lettuce, onions and tomato. Her fish was so BIG, though her lettuce was kinda sad looking and her tomato was green. Mixed reviews on this place. If you know of what we should try here, tell us, we may be back, maybe. Last year when I was home during the summer, my friend, Wen, said that JJ Dolan's pizza was some of the best pizza she's had. So, the other day, we went to check them out. 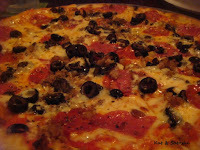 We tried the Giacomo (Jock O'mo): sausage, pepperoni, salami and olives. I think their pies are all large. The crust is thin but chewy. Oh, their plates are paper and if you need utensils, just ask, they'll bring out some plastic ones. 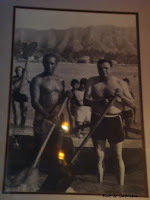 The place is a sports bar, so don't expect good lighting for blog photos. So was their pizza the best? I think so, as far as thin crusts go. 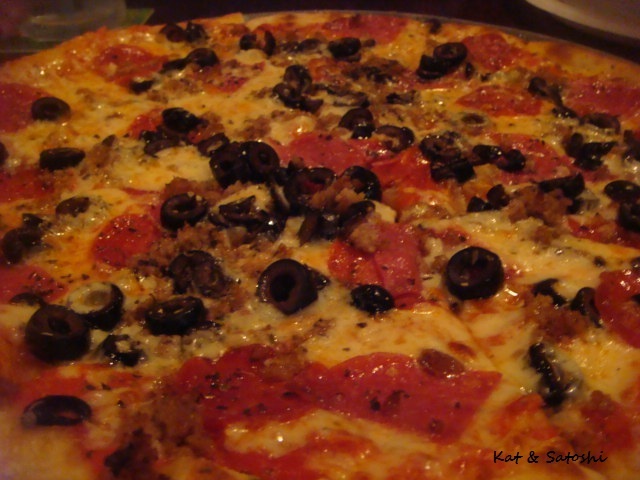 For a thicker crust I think I would still choose Big Kahuna. 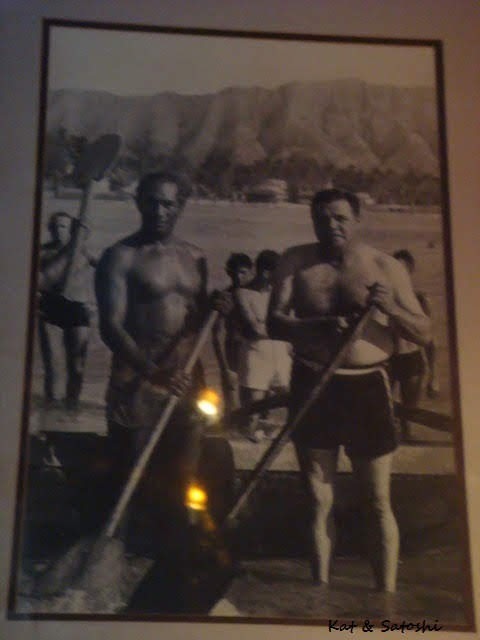 And you can never go wrong with a photo of Duke Kahanamoku and Babe Ruth together. They have other pub food on their menu too. 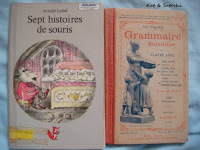 I found these at the Friends of the Library booksale the other week. Last year, I also checked out the sale, which I wrote about here. The one on the left is a translated version of Arnold Lobel's "Mouse Tales". I'm gonna see if I can get the english version at the library so I can write the english in the book I have. Then, when I read it, I'll know what everything means. 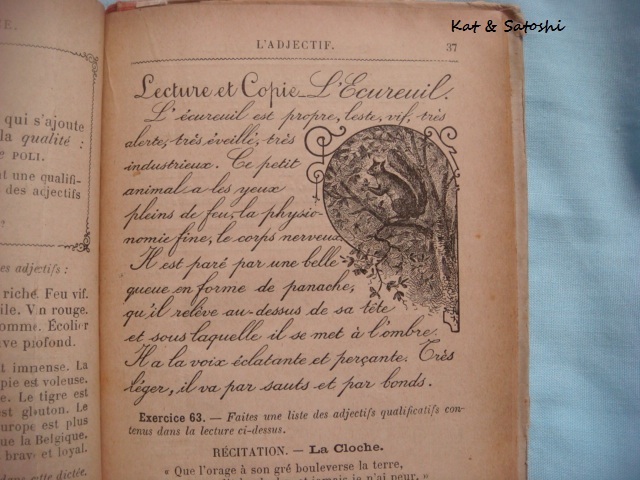 The one on the right is a really old French text book. 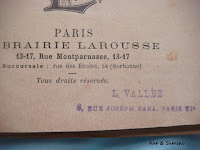 I looked online and someone had this book's date at 1890-1900?! I debated on whether to get this book or not. But the more I debated, the more I wanted it, so I got it. 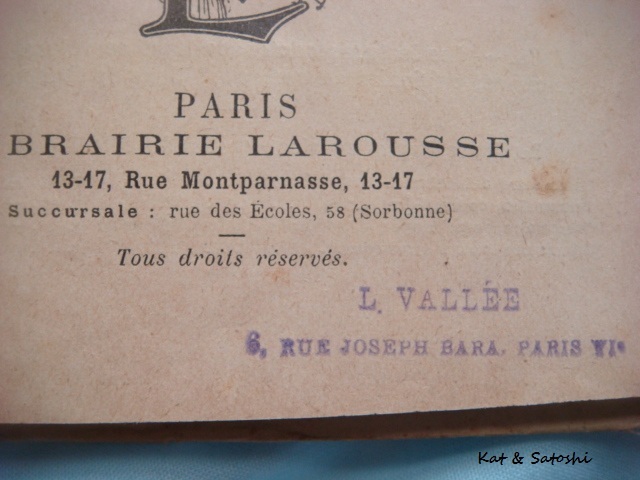 Am totally intrigued by the owner's bookstamp. 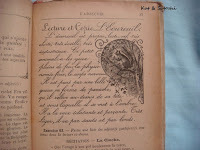 The pages are fragile and I love the different fonts and pictures. Best part is that it was the 2nd to the last day of the sale, so everything was half off...I paid $1.15 (with tax) for these two books. 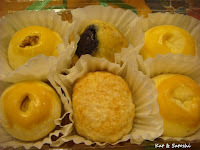 I had seen many people posting about this bakery, Kamehameha Bakery. Their trending item is their poi glazed doughnuts (the black-ish looking orbs). We tried getting our hands on these a couple of times, but they were always sold out. You know why? They open at 2 a.m.! So, of course when you go at 10 a.m. they are sold out of these babies. On Saturday, luck was with us, we were early, and even though there was a line out the door, it moved fast. 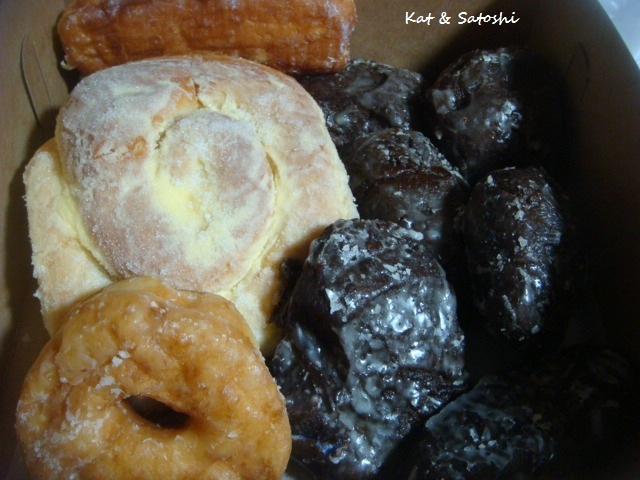 We purchased 6 poi glazed, 2 very large ensemada, 1 long john and 1 glazed. $9-something, which isn't too bad considering the ensemada is the size of someone's face! 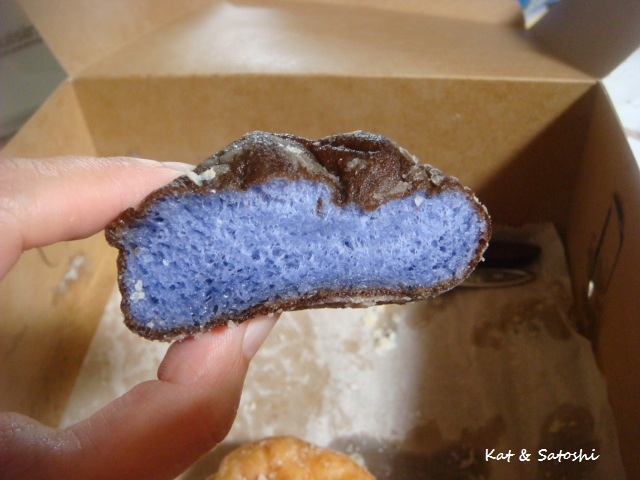 No poi taste, and the bright purple will shock you, but the poi glazed are good and soft. The glazed was good also, nice and soft like Krispy Kreme only better. Mom enjoyed the ensemada and long john. 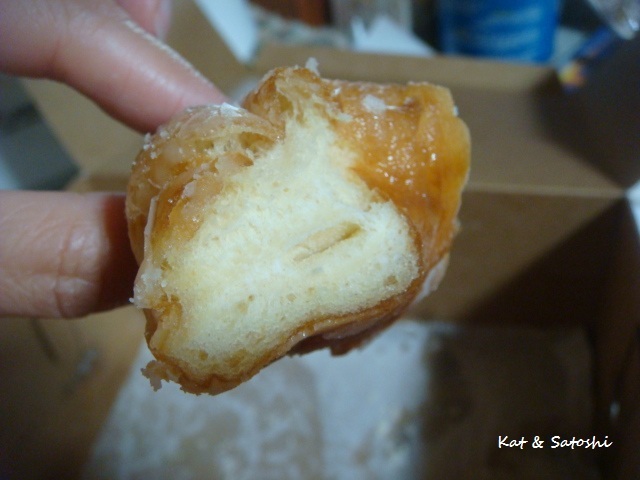 The long john cream tasted a little like haupia.